There may be nights where you may be working with your laptop without switching ON lights so that you don’t disturb others sleeping around you. 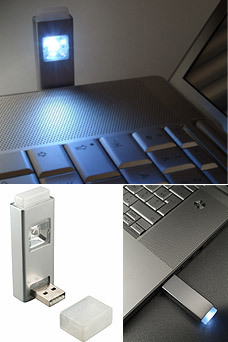 Working like that may be pain as you will be struggling with your keyboard in the dark, if that’s the problem then get yourself USB Light Gum LED Lamp which will give you company in those long dark nights. Just plug it to your USB port of your laptop and your laptops workspace gets illuminated, the product retails for around �15 (INR 860). I may consider buying such device for my new laptop (Yes you heard it right, will let you guys know soon ) as I prefer to work in dark environments. I feel for INR 860 this lamp is quite affordable. How much power it would consume is not mentioned in the product page and the effect on the battery of your laptop is also not known. You can buy this lamp here.